Tar sand deposits of eastern Utah. Origin, API gravity, chemical properties, and character of Utah tar sand bitumen. Recent increases in the price of crude oil have sparked renewed interest in unconventional energy resources, including Utah’s tar sands. Tar sands (also called oil-impregnated sandstones, oil sands, and bituminous sandstones) are, as the names imply, sandstones that are saturated or filled with black, heavy hydrocarbons or bitumen. The sandstone can be unconsolidated, that is, the sand grains are held together mainly by the bitumen, or it can be consolidated, whereby the sand grains are held together by silica or carbonate cement with the bitumen filling the remaining voids. The bitumen is viscous, relatively immobile in the rock, and cannot be extracted by conventional oil-production techniques. 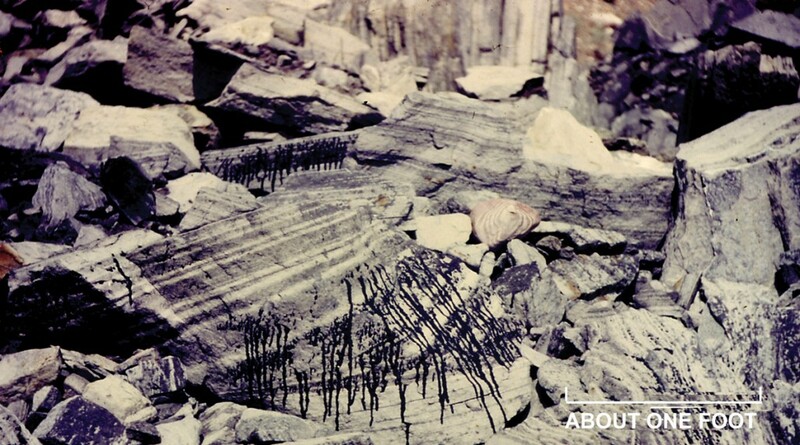 The bitumen often “bleeds” from outcrops that are warmed by the sun, however. North America has the greatest measured tar sand resources in the world. Canada holds the majority of these tar sands, followed by the United States. Utah’s measured tar sand resource, though small in comparison to that of Canada, is the largest in the United States. Smaller resources exist in Texas, California, Alabama, Kentucky, and several other states. The speculative tar sand resource of Alaska is nearly equal to the total resource of Utah. Utah’s tar sand deposits contain 14 to 15 billion barrels of measured oil in place, with an additional estimated resource of 23 to 28 billion barrels. These deposits are within the eastern part of the state (Colorado Plateau physiographic province). Twenty-four individual deposits exist in the Uinta Basin, mainly around its periphery, and an additional 50 deposits are scattered throughout the southeastern part of the state. Utah’s major tar sand deposits individually have areal extents ranging from 20 to over 250 square miles, as many as 13 pay zones, gross thickness ranging from 10 to more than 1000 feet, and overburden thickness ranging from zero to over 500 feet. The estimated/measured oil-in-place resources of individual deposits range from 100 million barrels to more than 22 billion barrels. A few geologic units contain nearly all of Utah’s tar sand resource. In the Uinta Basin, the Asphalt Ridge and Asphalt Ridge Northwest deposits are in the Eocene- Oligocene Duchesne River Formation, the P.R. Spring and Hill Creek deposits are in the Douglas Creek Member of the Eocene Green River Formation, and the Sunnyside deposit is in the Green River Formation. In the southeastern Utah deposits, the Tar Sand Triangle deposit is in the Permian White Rim Sandstone of the Cutler Group, and the Circle Cliffs deposit is in the Triassic Moenkopi Formation. By the late 1800s and early 1900s, many of Utah’s tar sand deposits had been discovered and described, and in some cases efforts were made to extract the tar or to use the tar sand as paving material. Increased interest in Utah’s tar sands really began in the mid-1900s as evidenced by an increase in the number of publications on the subject. By 1975, interest was fueled by the first major increase in the cost of crude oil above $10 per barrel. Tar sands were now viewed as less of a novelty and more as a new and hopefully less expensive source of oil. During the next 20 years, interest in tar sands continued, as did tar sand research, which included detailed geologic mapping and core drilling, bitumen characterization, development of bitumen extraction techniques, and development of bitumen upgrading processes. Funding for tar sand research during this time came from the U.S. Department of Energy and major corporations, as well as private and other sources. Unfortunately, in spite of the great amount of research, testing, and initial developments, a lasting and successful tar sand industry in Utah was not realized. After 1995, interest in tar sands waned, and tar sand research dropped dramatically even with the price of crude oil fluctuating within the $10- to $30-per-barrel range. Foreign and domestic crude oil supplies were abundant, so production of synthetic crude from tar sands was not profitable. In late 2001, however, the price of crude oil started a steep rise from around $18 per barrel to over $75 per barrel by 2006. During this period of rising crude oil prices, interest in tar sands, as well as oil shales, again came to the forefront, prompting tar sand and oil shale initiatives on the federal, state, corporate, academic, and private levels. With the high price of crude oil as an incentive, coupled with the vast amount of past research information that is available, new drilling, bitumen extraction, and upgrading techniques may provide the necessary ingredients for the successful and sustainable development of Utah’s tar sand deposits in the near future. However, in spite of the current favorable economical and technological setting, factors such as site accessibility, adequate infrastructure, water availability, environmental concerns, land access and permitting, and the heterogeneity of reservoir sands must be resolved before tar sand development will become a reality in Utah. Over the past two years, the UGS has been assembling an annotated compilation of over 550 references and data sources for Utah tar sands. The Annotated Bibliography and Databases of Utah Tar Sands, by J. Wallace Gwynn and F. Hanson (University of Utah), provides references to information on the geology, chemistry, extraction techniques and trials, and upgrading of tar sand bitumen in Utah. Sources of information include journal articles, theses and dissertations, UGS files, and industry files. Annotated bibliography of Utah tar sands and related information, by J. Wallace Gwynn and Francis V. Hanson, 143 p.
Blackett, R.E., 1996, Tar-sand resources of the Uinta Basin, Utah (a catalog of deposits): Utah Geological Survey Open-File Report 335, 122 p.
Campbell, J.A., and Ritzma, H.R., 1979, Geology and petroleum resources of the major oil-impregnated sandstone deposits of Utah: Utah Geological and Mineral Survey Special Studies 50, 24 p.
Utah Geological and Mineral Survey, 1983, Energy resources map of Utah: Utah Geological and Mineral Survey Map 68, scale 1:500,000.